On July 18, 2018, the Executive Board of the International Monetary Fund (IMF) approved a new 30-month Policy Coordination Instrument (PCI) for Serbia which will last until January 2021. Serbia has succeeded in addressing macroeconomic imbalances and restoring confidence. The country has successfully completed the three-year precautionary Stand-By Arrangement (SBA) in February 2018, and the authorities have restored fiscal sustainability, putting public debt on a firm downward path, and realigned the external position with fundamentals. The PCI-supported program will build on the precautionary SBA and aims at maintaining macroeconomic and financial stability and advancing an ambitious structural and institutional reform agenda to foster rapid and inclusive growth, job creation and improved living standards. Program reviews will take place on a semi-annual fixed schedule. While the PCI involves no use of IMF financial resources, successful completion of program reviews will help signal Serbia’s commitment to continued strong macroeconomic policies and structural reforms. “Serbia has chosen to cement the success of its 2015-18 Precautionary Stand-By Arrangement with a new economic reform program focused on strengthening institutions and improving competitiveness for faster growth, which are critical to secure sustainable growth and faster convergence with EU living standards". As far as country's monetary policy is concerned, it has kept inflation under firm control while supporting economic recovery and maintaining broad exchange rate stability. The confidence instilled by the improved macroeconomic situation has been reflected in rising investment, both from foreign and domestic sources and supported an economic recovery. Overall, the economic outlook remains positive. Growth reached 4.6 percent year-on-year in the first quarter and is expected to reach at least 3.5 percent in 2018, driven by consumption, investment, and exports. Inflation remains low and is projected to be around 2 percent at end-2018, supported by the appropriate monetary policy of the National Bank of Serbia (NBS). Budget results for the first quarter of 2018 point to another year of fiscal surplus. 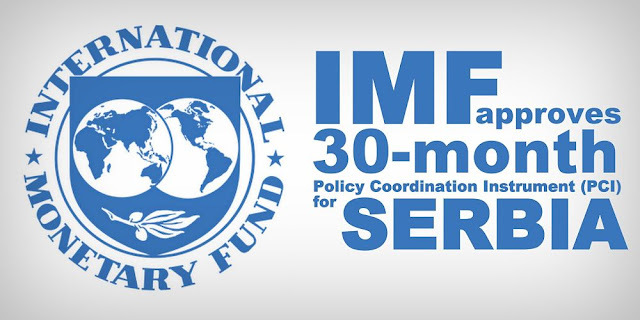 Serbia's Finance Minister Sinisa Mali estimated that the new arrangement with the IMF is very important because it shows that the Republic of Serbia in the previous period achieved good economic results and that it no longer needs financial assistance. He emphasized that the main objectives of the program are to maintain public debt in defined terms in relation to gross domestic product (GDP), maintaining the overall deficit in defined frames in relation to GDP, reforming the public sector salary system, continuing the Tax Administration reform and establishing measures for reduction of the processing time of VAT refunds, adoption of a new law on fees and maintenance of inflation in the defined frameworks. "We are fully committed to these goals and this will be our absolute priority in the coming period. It is important that we strengthen our institutions and make them even more efficient, and here I mean first and foremost to the modernization of the Tax Administration, which is necessary," Mali concluded. Nonetheless, Serbia remains susceptible to spillovers from regional and global developments and market volatility, including potentially increased risk aversion for emerging markets. On the domestic front, delay in delivering on structural reforms, or erosion of fiscal discipline, could undermine confidence and reduce medium-term growth prospects. NOTE: The PCI is a new instrument, available to all IMF members since 2017, specifically designed for countries seeking to demonstrate the commitment to a reform agenda or to unlock and coordinate financing from other official creditors or private investors. For more details, click here.